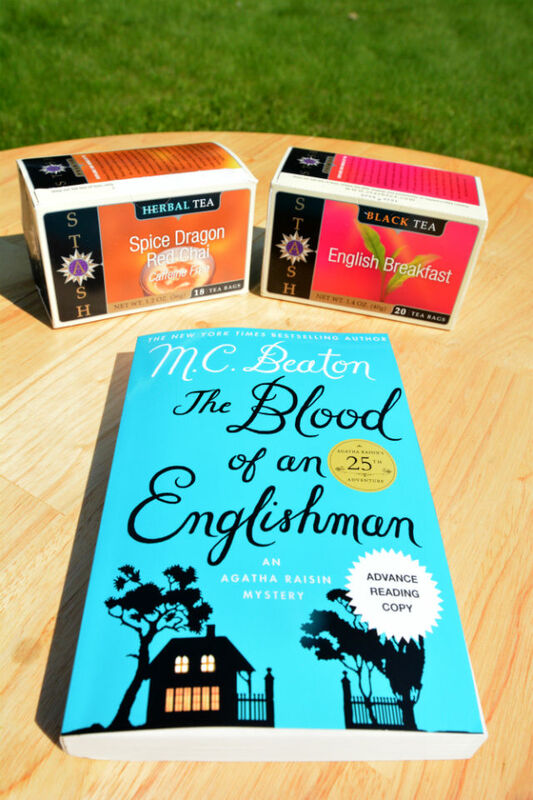 The Blood of an Englishman is something Agatha Raisin must investigate in her 25th adventure. So, while she does that we decided to investigate the blood of an American. 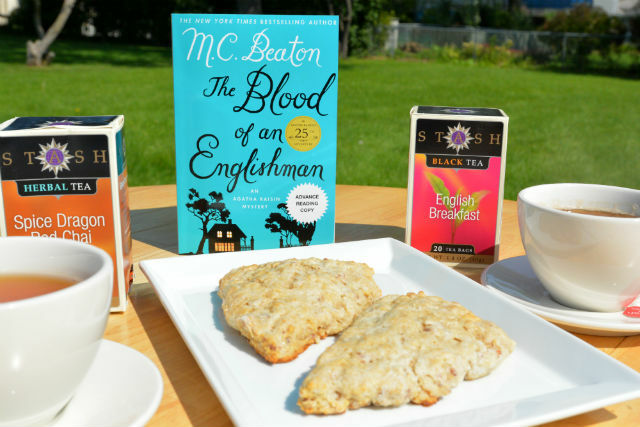 Knowing that there are some foods we just can’t turn down, we opted to preview The Blood of an Englishman with our Stash tea and bacon scones. They are no fuss just like Agatha. They look a whole lot prettier than it takes to make them and they aren’t sweet. A recipe that I believe Agatha might like herself. No sweet teas here. Yet, we decided to forego the brandy even if it is excellent after a trying day. We weren’t in the same boat as Agatha. We are just sitting back to enjoy her work as she prepares to solve the case. The best part of Agatha’s detecting style is that she doesn’t rely upon convenience. 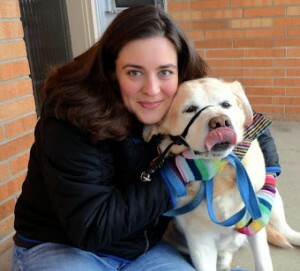 She is willing to go the extra distance and talk to all persons of interest. She even takes the time to go on a date because she is wise enough to know that obsessing over a mystery isn’t really living. Agatha is capable of being persistent to ferret out all the evidence but she isn’t willing to sacrifice her chance at love or happiness. Her character is one that can win over any audience because she’s not willing to compromise and isn’t going to sugar coat anything. You’ll have to enter to win your own copy to figure out just whose blood is spilled. Why does the local baker meet his end? Who is out to manipulate the villagers? Is there love during the course of an investigation? Will Agatha get married again? Will Winter Parva be able to outwit Agatha Raisin? How does the blood of an Englishman spill the secrets of one small town? 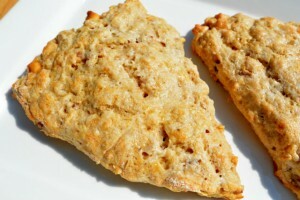 Before we get to the giveaway, here’s our Bacon Cinnamon scone recipe! A classic English scone with a twist. Bacon and cinnamon are the perfect pairing in this scone. Preheat oven to 375 degrees. Line a baking sheet with parchment paper or a silicon baking sheet. In a medium mixing bowl, whisk together flour, baking powder, baking soda and salt. Cut in bacon fat with pastry cutter until it resembles coarse meal. Add bacon, cinnamon and white chocolate chips. Mix in buttermilk. On a floured surface, form dough into a rectangle. Slice into 3-4 triangles and place on baking sheet. Brush with heavy cream and sprinkle with raw sugar. Bake until golden for 15-18 minutes. Remove from oven and serve warm. Ready for the contest? One winner will win their very own copy of #BLOODOFANENGLISHMAN! To enter use the rafflecopter form below. Contest open to US residents ages 18+. Good Luck! I like apricot scones that I find at our local farmers market. My favorite is oatmeal maple, but the bacon cinnamon may give that a run for its money. I love plain scones the best. I love chocolate chip scones! !